The SAO Widefield InfraRed Camera (SWIRC) operates at the f/5 focus of the MMT. 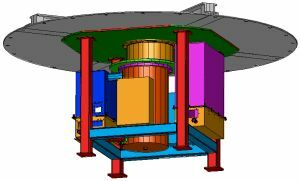 Proposed in May 2003 and commissioned in June 2004, the goal of the instrument was to deliver quickly a wide field-of-view instrument with minimal optical elements and hence high throughput. The trade-off was to sacrifice K-band capability by not having an internal, cold Lyot stop. SWIRC has three science filters: Y-band (1.02 um), J-band (1.2 um), and H-band (1.6 um), plus a dark slide. The instrument is based on a 2048x2048 pixel HAWAII-2 detector; its 0.15 arcsec/pixel plate scale fully samples the best seeing at the MMT, and provides a field of view of 5.12 x 5.12 arcmin. Beginning 2015C, MMIRS is at the MMT and should be used in place of SWIRC.